Sanctuary is about that place in the interior landscape of music to which a musician retreats to attempt to solve musical mysteries. The colours and the light that reflect from limpid pools of melody, refracted by glacial harmony through shards of glass bouncing off the pulse of arresting rhythm. It would seem well-nigh impossible for a drummer to communicate all of this stirring drama in song. But not by Richie Barshay. The drummer feels music in the depths of his soul and the music on this disc confirms that. The music contained within the recording is a molten mix of folk tales in the language of the music of the Americas and it is magnificent. You feel his sensitivity and his ingenuity as a composer in the manner in which he plays throughout; tenderness is unabashedly reported in the slow movements of his songs. So dramatic is this feeling that you feel the blood pulsating gently in your head. But then there are times when the music picks up the pace, as in “Forro de Dois Amigos” when the music quickens the pulse becoming a call to get up and dance. These are the most exuberant, lyrical parts of this recording, brimful of virtuosity and enchantment. 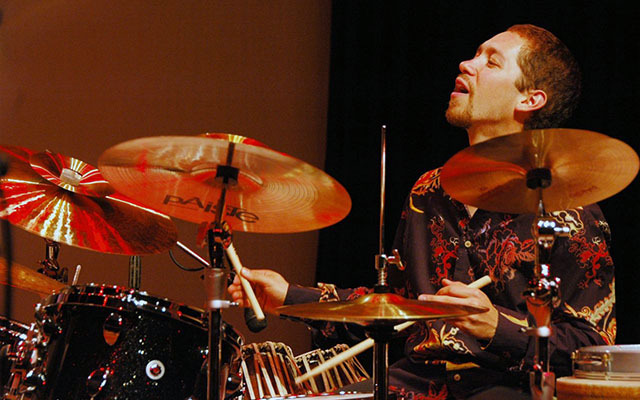 Richie Barshay is a drummer with a natural feel for time; a master of rhythm. But there is also a fine lyrical side to the drummer in a way that few other drummers of his generation have. This is brilliantly audible in the slow movements of his music where he is calm, almost icy calm, until he comes upon a point where something extraordinary happens: an outburst so ferocious that the drums become an instrument of rolling thunder. The only respite then comes from the delicate swishes of brushes on cymbals and high-hat… Richie Barshay is on flying high and his drums are singing. It is then that the drummer offers a quite diverse perspective of his music: an incredible kaleidoscope of different moods and atmospheres. He is sort of like a coiled spring ready to bring out the true ferocity of his battery of drums. It is so symphonic and dynamic and heroic and touching. 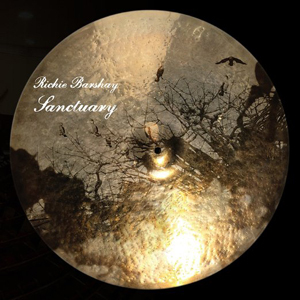 On Sanctuary Richie Barshay is joined by a master of that very kind of chameleonic aspect of music: Chick Corea. Mr. Corea brings to the music majesty and mysteriousness that is for me, one of the high points of the recording, His three appearances remain superior pieces of mastery. When Mr. Corea plays darkness turns to light. It is like the sun is shining suddenly as melancholy has been lifted. Chick Corea has that almost mystic quality to his music. Mr. Corea is not the only musician who, apart from the chief protagonist, Richie Barshay, makes this programme come alive. The beauty of Jo Lawry’s vocals is ineffable. Petr Cancura makes his grand presence felt throughout, as do guitarists Todd Neufeld and Ryan Ferreira. The bassist Jorge Roeder appears like music-charmer as he weaves his way in and out of the melody with some of the finest bass-playing that Richie Barshay could ever expect in his music. The whole recording is incredibly imaginative and daringly modern. Track List: Mi Vida; Forro de Dois Amigos; Sycamore; Bandalabourou; Trouble; Big Brother; Baghdad 1920; Airport to Nowhere; Windy Blues. Personnel: Richie Barshay: percussion; Jo Lawry: voice; Petr Cancura: reeds and mandolin; Jorge Roeder: bass; Todd Neufeld: guitar (1, 3, 4, 6, 7, 8); Ryan Ferreira: guitar (2, 5); Special Guest – Chick Corea: piano and keyboard (2, 5, 9).